MANCHESTER CITY LOOK ‘scary’ and could be on the verge of establishing a ‘dynasty’ under Pep Guardiola, according to Arsenal legend Thierry Henry. Guardiola lifted his first trophy in charge of City on Sunday, as City swept aside Henry’s former side Arsenal in the EFL Cup final. City ran out 3-0 winners thanks to goals from Sergio Aguero, Vincent Kompany and David Silva at Wembley, exposing a poor display from Arsenal. 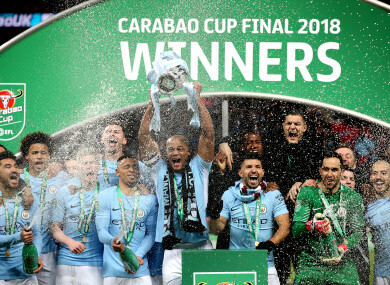 The victory means City are likely to win at least two titles this season, with Guardiola’s men 13 points clear at the top of the Premier League table after 27 matches, though they will be aiming for a treble that includes Champions League success. City have been so impressive this season that Henry thinks it could be the start of something very special at the Etihad Stadium. “They do have money, a good manager and it looks like they’ll win almost everything this year,” Henry told Sky Sports. “The coach will attract players and they’ll win the league. We don’t know about the Champions League yet, so we won’t get carried away, but it looks like the start of dynasty. “Will it happen? It remains to be seen. I’ve known Pep for a while – he won’t let complacency come in. I see them being good for a very long time. If you think about it right now, it does look scary. “Nothing is set in stone. Last year they didn’t win anything and they were criticised. People doubted Pep and the way his team played, now people are saying he’s the best. After Sunday’s match, Henry made no secret of his desire to be Arsenal manager should Arsene Wenger depart, with the 68-year-old likely to come under increased scrutiny in the wake of the defeat. Henry opted not to again declare his interest in the job, instead highlighting how Arsenal have struggled for consistency over recent years. “It’s difficult to know what the future holds for Arsene Wenger, because I’m not there behind closed doors to see who decides what is going to happen,” Henry said. “Pep has momentum with his team at the moment and he had to deal with having a bad season for the first time in his career. When you look at the team, it’s almost the same team as last season, just except Ederson and Kyle Walker. “He made them understand what he likes to do. Arsenal are in bad momentum and that can keep coming back. “You need to be consistent. We’ve seen them beating Chelsea, seen them doing well at home over the years, in the league, Champions League, but the consistency isn’t always there. Sometimes you need to have good away games as well. Email “Thierry Henry: 'It's difficult to see how someone can stop City. It does look scary'”. Feedback on “Thierry Henry: 'It's difficult to see how someone can stop City. It does look scary'”.